Water-Water-Everywhere is our theme this week at Digistamps4Joy. What a great theme - especially since it rained most of today. LOL!!! This morning I was watching the Weather Channel and saw that there are parts of the country that are under a Winter Storm Warning. What? It's the end of April? Since Winter seems to be hanging on in some areas, I thought it was the perfect time to post this card - the sentiment fits today perfectly! The image is "Spring Medley" from From The Heart Stamps. The sketch I used is from their sketch challenge. I used a Spellbinders Embossing folder and some paper from DCWV. The image is colored with Spectrum Noir markers. Crafter's Cafe is adding glitter this week! What girl doesn't like to sparkle? LOL!! I'm not a real fan of glitter when it's lose, but I sure do love Stickles so that is what I used to add some sparkle to my image from Rick St. James. I glittered the balloon and also the edges. And now this card is on it's way to a young girl who has some physical challenges. Why not get out that glitter or Stickles and come on over to Crafter's Cafe this week....cause I need ideas on how to use more sparkle in my life. I'm an animal lover. I love them all! Ok, maybe not spiders but I love animals. Our new challenge at Kitty Bee Designs Aloha Friday is Animals. Our sponsor is A Random Fan and there are so very cute images with animals! I chose to use an image called "Autry and Poodle". I liked the French feel and I wanted to keep it black and white with just a pop of red. Pattie's Creations Design Challenge is starting a new challenge this week and with Easter being this weekend - what else could the theme be? Did you know that Pattie's Creations offers a freebie every month? For my card I used the freebie that was offered the first Friday of this month - Duckie In Egg. I decided that I wanted to make a statement with this card: that you don't have to spend a lot of money to make cards. The image is a freebie. The papers were scraps from other projects as is the ribbon. And I colored the image with Bic Sharpies. So many people use Copics and get wonderful results. But some people just can't afford the investment of those markers. I once bought a set of Sharpies at Staples with a coupon - I think I got a set of 40 markers for around $12. Certainly you cannot get the same results as you can with Copics or Spectrum Noir markers....but you can still create a nicely colored image. Thank you for stopping by today. God bless you!!! 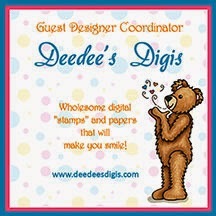 "Under Your Wings" is the title of this month's featured digi at Deedee's Digis. Owls are so popular and this little owl image comes with a great assortment of sentiments. Plus you get the image colored and uncolored! What more can you ask? Well, there is more!! When you enter this month's challenge using "Under Your Wings", you will get next month's set FREE! Gotta love those freebies! I don't have a color printer so I used the black & white image then colored it with Spectrum Noir markers. The embossing folder is a wood grain folder by Sissix. Thank you for stopping by today. God bless you!!!! Being part of the Kitty Bee Design Team is such a blessing! One thing that is really neat is that there is a Design Team Spotlight and today it's me! I love the Kitty Bee images. It's so hard to just chose one to use. But since Winter was so long and harsh this year and Spring has arrived here in Ohio I wanted to use an image that reminded me of Spring. I used "Under The Stars Bear". You can find him and all the other great images at the Kitty Bee Designs store. I used some papers I had in my stash along with some Washi Tape - doing a take on one of the Freshly Made sketches. Can you believe that Easter is right around the corner? It's very close so it's time to make those Easter cards! At Kitty Bee Designs we are helping you with that task by giving you a challenge to participate in so you can make those cards. For my card I used an image called "Three Amigos" by Stitchy Bear's Digi Outlet. I thought it was so cute!!! I had some scap papers that I was able to use too. The image is colored with Bic Sharpies and Spectrum Noir markers. I don't think I've made a card just for fun in a while. So it was fun to sit down and go through my digi's and just pick something out randomly! I loved this fruit image...it's from Doodle Pantry. I found the cherry paper in my stash and thought it was just perfect. Thanks for stopping by!! God bless you!!!! Do you have any idea how many creative folds there are out there? Are you one that makes cards folded many different ways? If so - do I have the challenge for you!!! Pattie's Creations Design Challenge theme is "Fancy Folds". The only rule is that you must always use an image in your creation. I've noticed I do a lot of confession here on this blog and today I'm doing another one.....I don't typically do any fancy folding. Yeah, I know...I get stuck in a rut but it's where I'm comfortable. I think that's why I like doing challenges - it's forces me outside my little box. For my card I used Pattie's wonderful "Pocket Watch" image. I thought about coloring it - but then I decided to just take some inks in various colors and ink up the whole image and paper. I've seen it done but have not done it myself (at least I don't think I have in the past). Shocking - I really liked it it turned out! The fold I used is a double z fold. It's a simple card (as are all my cards), but I did really like the final results. And this card is already in the mail too. Stop by Pattie's Creations Design Challenge and join the fun. Plus be sure to pick up the freebie available (for a short time). I love birds. There is just something about them. Maybe it's their ability to fly. Maybe it's because when they soar they look so free. Maybe it's because their songs are so pretty. I don't really know what it is - but I just adore them. It doesn't matter what size they are - the small ones the large ones - they all amaze me. So when the theme at Digistamps4Joy is "Things With Wings" - of course I have to use birds! I used an image called "Juvenile Trio" and it's just so sweet! I wanted the image to be the sole focus of the card so I kept this one very simple - just color the image and add little paper punched out for something extra.....that's it. If you have never checked out Digistamps4Joy I encourage you to do so....there are SO MANY DIFFERENT IMAGES! It amazes me!!! !